So the basic element of data navigation and collection is a list of samples. This list will identify the properties of the data collected and tell the system, what to do to and the names of the files collected or to be collected. So TF has a couple of different ways to do this. The first and easiest is to make a template of the defined sample grid you want to use. 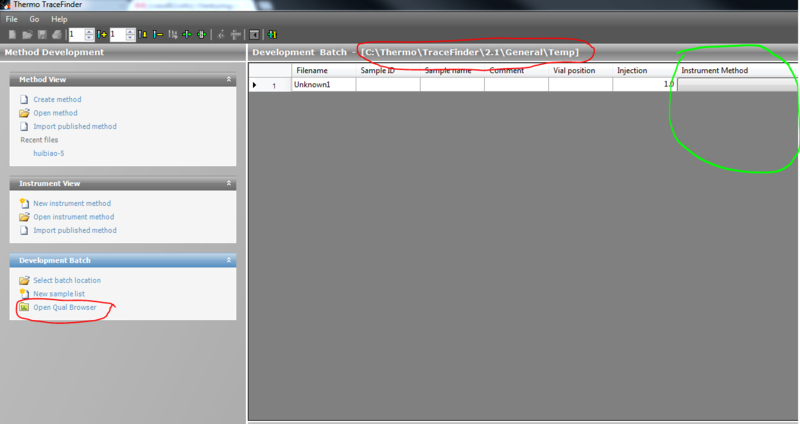 In TraceFinder, the user can define the columns that are displayed in both the data results and sample definition grids. In Batch View or in the sample page of the Acquisition Mode/Wizard, right click the mouse in the grid and a menu dialog that opens up. In that dialog , select “Export to CSV”. This will make a copy of the grid and the header lables is a file that can be opened by any editing grid application. The most common is Excel, but you could open in a text editor also. Simply, open the file and for daily use just input sample information in the template and save as a daily/batch .csv file. A LIMS system, can create a .csv file in this same format or even use a bar code reader to fill in certain fields even in Excel. Once the sample input is done save the file as .csv and close the editor. If the file is still open in Excel, MS Office will not let it be used by another program so TF can’t import it until it’s closed. Right click in the grid and select “Import Samples”. The Dialog below opens, then select the appropriate file. The information contained in the CSV file will be inserted into the grid either at the end of the current data or where the index indicator is if that is the option selected in the drop down list below the browse section. There is also a xml format that can be created fromat LIMS system that can be used, or if Xcalibur has previously been in use the .sld files can be utilized also. Any sample type that TF does not recognize will be set to the Unknown Sample type. 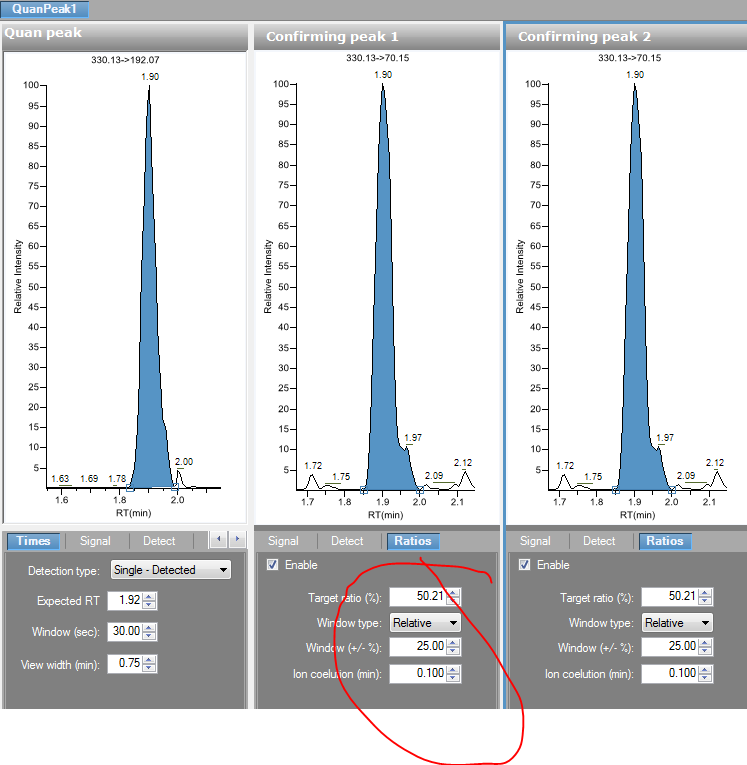 In TF Methods Ion Ratios can be set but updated not to calculate if needed. In this case the user may find that they have set up a sort of generic method with two confirming ions. The body they are doing the work for requires only one as part of their data set. The user can simply go to the method and select an ion and disable the calcualtion by unchecking the “Enable” box on the ratios page. 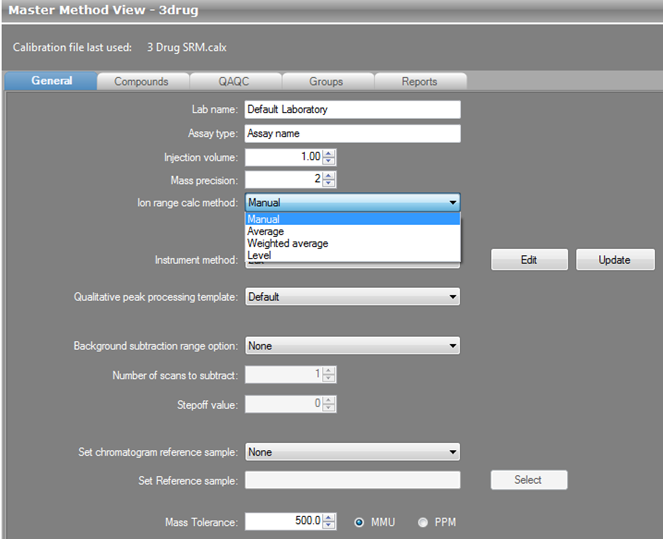 The ratio wont be calcualted and the chromatogram will not be displayed in data review or on reports. 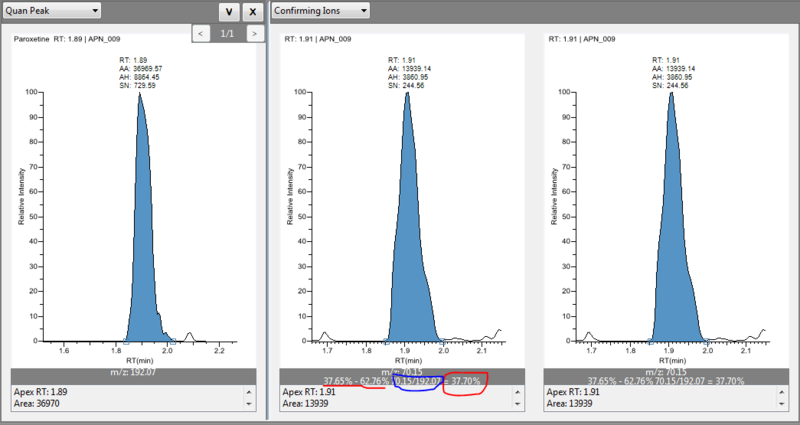 Well, Once you’ve processed your data, in Data Review of Analysis you can select a tab or display window to see Ion Ratios. Below you can see the range of the accepted Ion Ratios as defined in the method, underlined in Red. The Definition of what ion is measured, Underlined in Blue. Finally, the actual measured ratio is circled in Red. If this value had fallen outside of the acceptable range then the peak itself would have a Red border around it. One of the key features of TF is the use of a compound being composed of multiple components. So the gist, of it is that a specified compound can consist of up to 6 quantitative peaks, each of those can have up to 10 confirming ion ratio peaks. 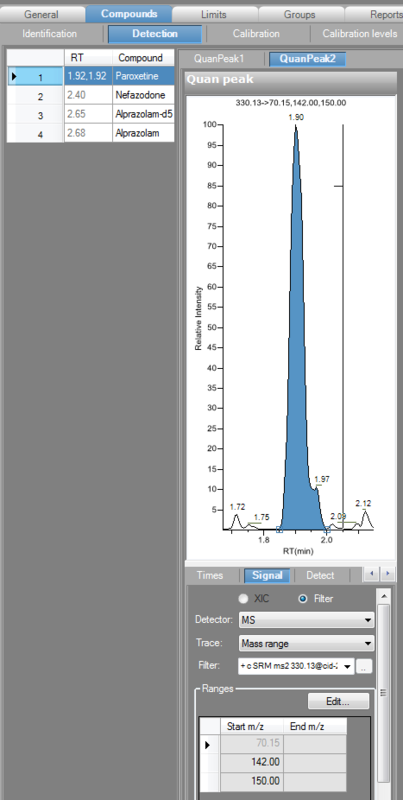 So A compound can consist of up to 66 chromatographic peaks when using mass spectral data. 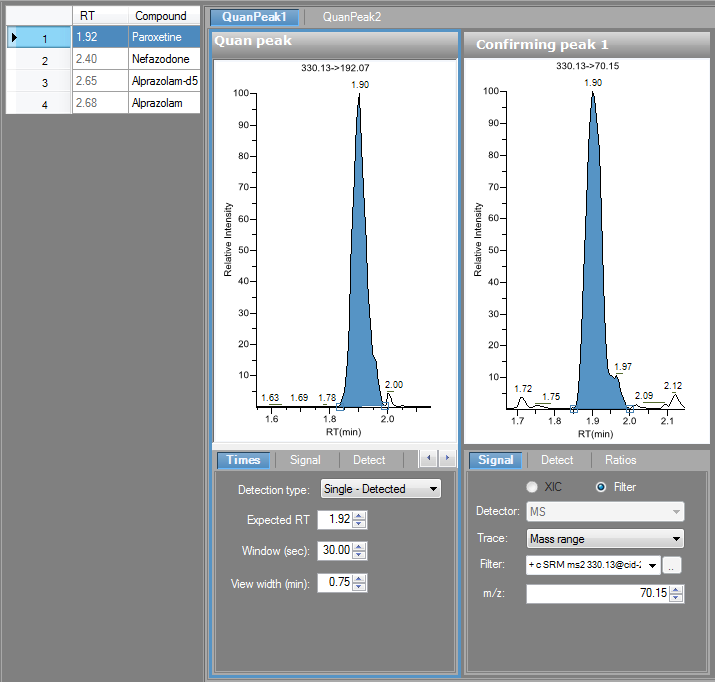 This means that you can visualize under the compound name quantitative peaks and their associated ion ratio confirming ions. The compound is composed of these multiple peaks, which have summed areas. But they can be visualized separately. The total response of adding all the, lets say peak areas, is the total response of the compound. 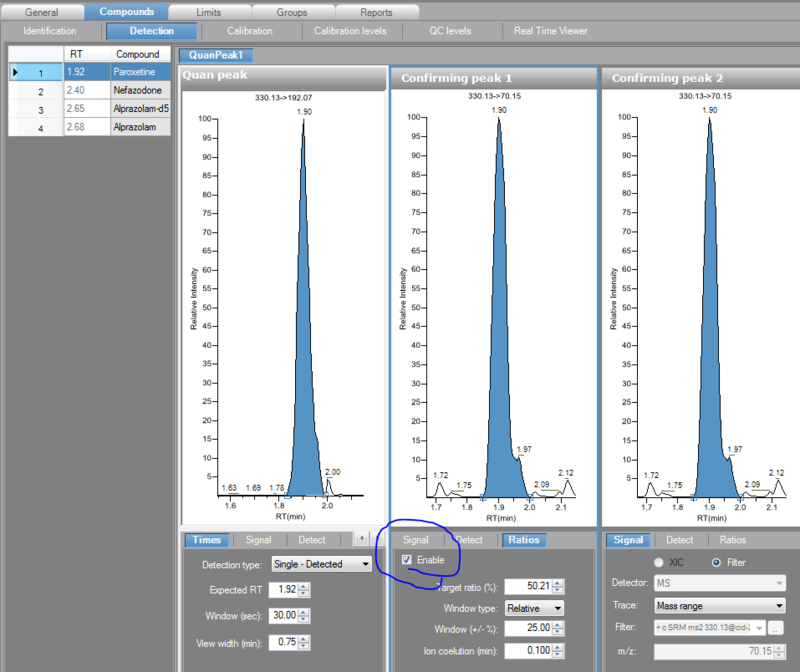 And by using the multiple quan peak feature, these chromatographic peaks don’t have to be at the same retention time. So if you were doing a chiral separation but wanted the total response, you would just make them individual quan peaks under the compound. Now if you have coeluting peaks and want one big peak to represent your compound, then you can use the signal pane’s mass grid to accomplich this type of mass intergration. All the responses are summed, but no individual visualizations. HMMMMM…. Why am I golden but not green.. on my status ball. All computer systems in the world, from a Operating System to specific applications like TraceFinder have a file managing system. Typically called an I/O or File I/O, for In and Out. This manages the handling of a file and the opening and closing of a file to extract data or other things inside the file. Inherently TF and Xcalibur being from the same family of applications, act like siblings and try to grab the same file if they are both open at the same time. If this happens then sometimes the door handle flies off and someone gets stuck inside. When this occurs then rawfile will apprear as yellow status meaning it is acquired but not processed. To fix this you just have to make sure xcalibur is shut down. and then proces the file. If for some reason that doesn’t work then you may have to reboot the PC. Not the best of situations, to say the least. So Word To The Wise. Only use one Application at a time when Acquiring Data. What the Heck is a Ion Range???????? So one thing that has been resurfacing is confirmations that I know what think is my data really is my data. TF uses one such tool in Ion Ratio calcualtions. This is a ratio of the selected response of one defined peak that is connected to another defined peak. In TF, we define that as, a Confirming Ion has a Ratio to the Quan ION/Peak, and we can set some acceptance threshold around that ratio. Now, we have a few ways of defining the Ratio. Manual – Where you type in the Target Ratio. Average – Where the Ratio is deteremined by Averaging the ratios found in the calibration curve for these peaks and then producing an average. This automatically sets the Target Ratio, so you don’t have to. Weighted Average – The same as above but its weighted and usually used for really large orders of magnitude methods. Level – Again its like the above but it only finds the Ratio for the one specified calibration level. The last three allows the data to define your criteria, and keeps you from having to adjust the ratios manually. This can be done for processing on the fly or in post acquisition processing. So after all is said and done, in the routine world, data really relies on the basic two dimensions. To put it all together we need to setup a way to detect what is really meaningful out of a line of connected dots using these two dimensions. There are a plethora of detections alogrithms out there. We at Thermo typically use Two (ICIS and Genesis), sometimes a third. As in anything we need a starting place. In TF we give you the ability to set up what you want your Default detector to be. This also gives you the option to set the default conditions. Hint: I gave you my preferred default settings in an earlier post. You use these settings when you make a new compound/peak in a method. But you can also set up default conditions for you’re other alogrithms. So, if you find the need to change one that has already been assigned to a peak, you’ll have your preferred setting right off the bat. So this is one place where you can defind your freedom of choice. If you are using the development batch to work up your methods. Then you know you can open up QUALBROWSER from the Development Batch Section. 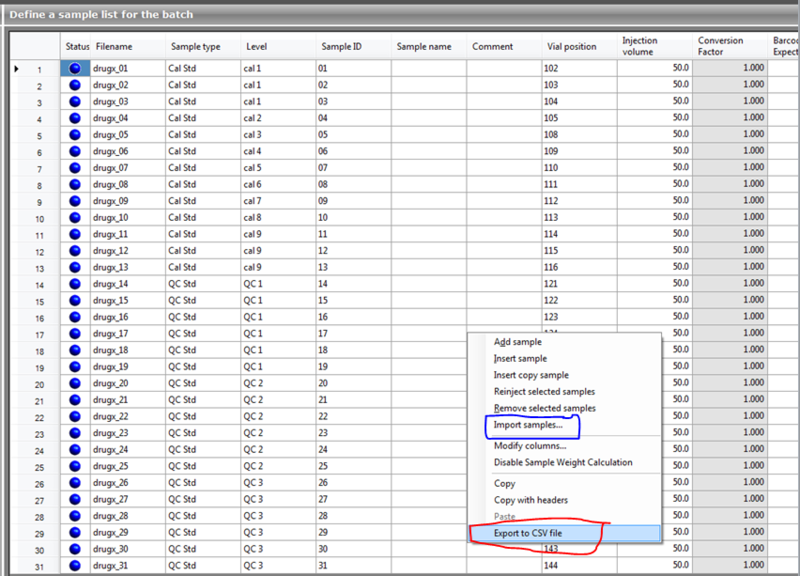 So in addition to being able to select a different instrument method for each row, from the Xcalibur methods folder. A .sld file is generated for the contents of the batch. These are stored in the directory you selected for the batch. Highlighted in Red. 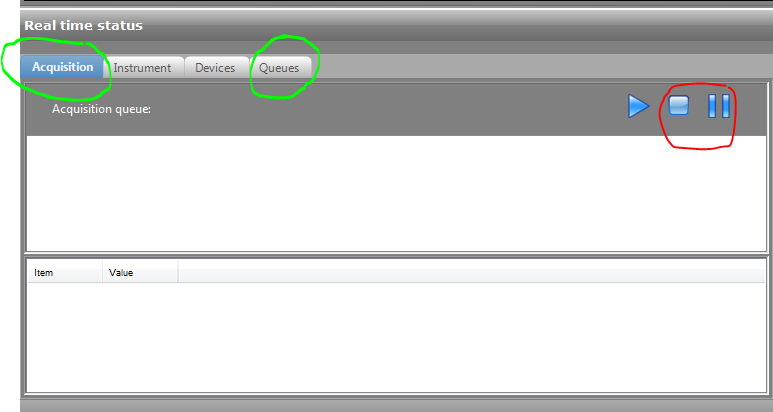 So you can point Qualbrowser’s open sld file menu option here, so you can open and navigate the rawfiles in the batch. And this same .sld file can be used again and again to produce different batches in Development Batch. In the link above you can find the installation instructions, plus a process that tells you how to register your copy of TF. So if you see the above notice, you have that amount of time to register the product. After this runs out you will not be able to open TF. It will only open to the registration page until a license is obtained. Just enter in the your info and email the text, “Blob” ,to the address listed at the top. This occurs whether you have a demo or full version. This is also the only way to extend the demo version by a specified amount of time, which is handled on a case by case basis. If you are a Thermo Employee. 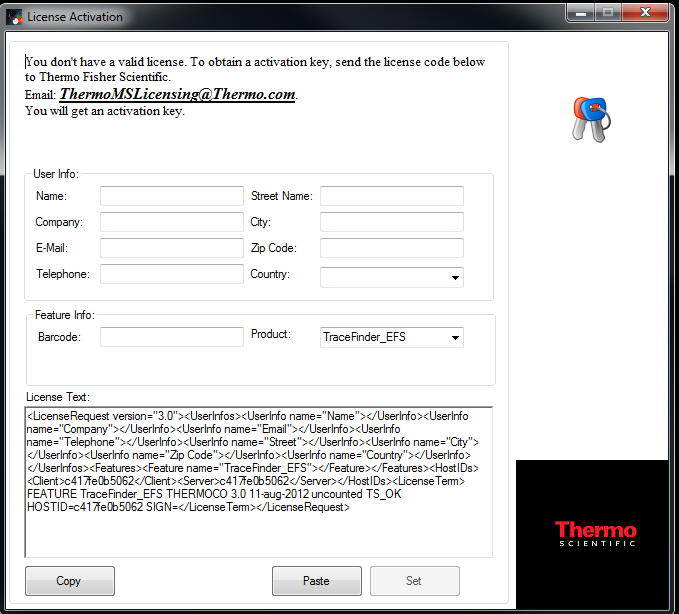 Please register your version and as long as we are sending this to a Thermo email address, then YOU, will receive a full license. BIG HINT: The license is good for one PC. It is Mapped to the motherboard’s MAC address. So it is not transferable between systems. Each purchase gives the user the right to install on two PC’s TYPICALLY, the instrument PC and an offline processing station. 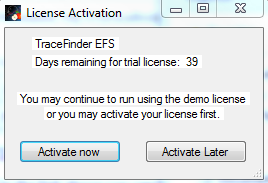 In TraceFinder there are a couple Queue List to consider. So First there is the Acqusition Queue. This is a list of samples being acquired by instruments that TF controls. All these can be paused or stopped. Pausing simply hold the allows the current process on the curtrent sample to finish and then it waits. Once this is done then you can remove or restart the things that were previously QUEUED up. All instruments of all vendor with all software applications have issues with batching and removing batching of sample in some form. No matter what you might use in the lab its always a best practice to let instruments go home before giving them new instructions. Another word to the wise: If you are acquiring data Pause the queue and then remove samples from the Acquisition Queue. Let all the instruments finish their processes of rehoming themselves, in the case of the autosampler, or finish the gradient flow in case of the LC pump. This will allow for the system to be in a good known state when you remove samples fromthe queue. Otherwise the messages to the instruments might get cross with each other.